Today is November the 2nd and today in Campbell River, BC Canada, we got our first snow. For some of you that may seem like a normal thing for early November (I grew up in the B.C. interior, so to me its normal), but here on Vancouver Island, it is not. So when flurries were in the forecast, I figured it was some sloppy flakes that would melt before hitting the ground. Instead as I set in our local coffee shop, The Island Grind, the flakes got bigger and bigger. It was glorious! And it continued for a good few hours never truly sticking to the ground for any length of time. I always find it funny here, no matter when snow arrives, it either puts people in a horrid mood or a wonderful lovey mood. Either way it's always extreme. For myself, I feel very much like Lorelei Gilmore - I love snow! I found myself jumping into more thinking on Christmas and what I would like this year to look like for us as a family. Wanting to be sure that we keep the focus on what is important and the true reason for the season. I was thrilled to find the latest issue of life:beautiful magazine in town today. And it thoroughly put me into the Christmas spirit. Now, I am not receiving anything for saying this, but I have to tell you, I never miss an issue! 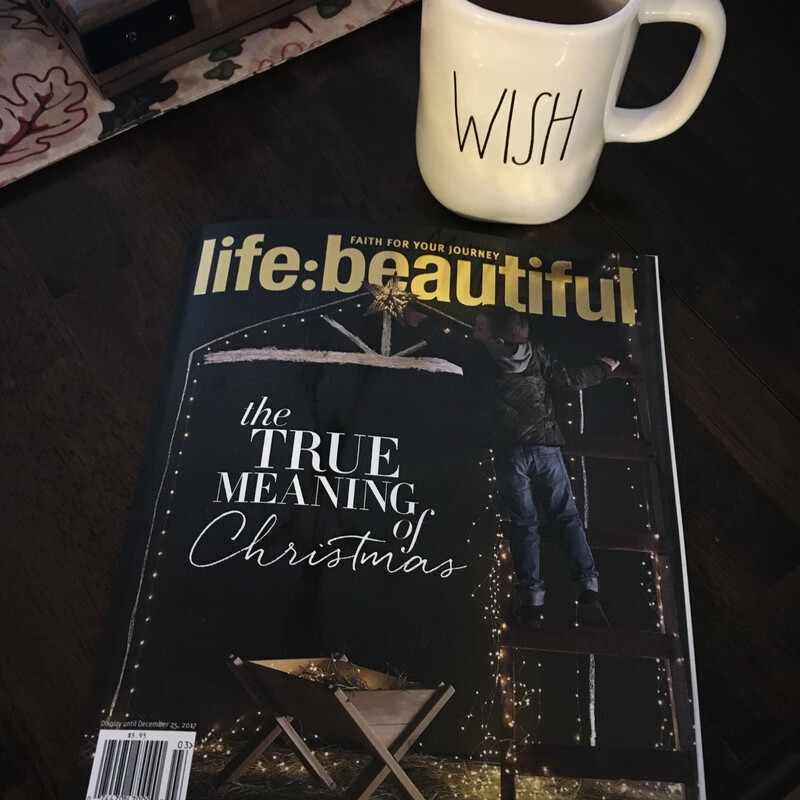 It's a beautiful magazine filled to the brim with so much Christian goodness. And what makes this a steal - its only $5!!! I love it! Okay love rant over!! Back to thinking about what I would love to instill in my family routines for this year's Christmas season. More Christ and less commercialism. Don't get me wrong! I LOVE IT ALL!!! LIGHTS! COOKIES! SANTA! PRESENTS! BUT- That's not all the season is about, as we know and so this year we are scaling back. Not only will this help in some of our recent and past financial woes, but will also make more time for family presence over the shopping and presents. So follow along with me. I will be keeping you abreast of the situation here at my house. I would also LOVE to hear from you on what your family holds dear at this time of year! What are your ways of keeping Christ in Christmas?